Occurring during the High to Late Middle Ages, the Crusades were military campaigns with the ostensible goal of regaining access to the Holy Lands around Jerusalem. Over the almost 200 years of warfare, seven major crusaders and many minor ones took place, involving hundreds of thousands of combatants sworn to serve as soldiers of God. Many notable military orders formed during the Crusades, including the Knights Hospitaller, Knights Templar, Teutonic Knights, and others. 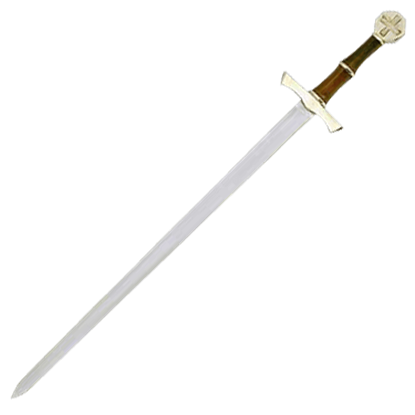 At Buying a Sword, we carry an excellent variety of Crusader swords inspired by the weapons wielded during these historical campaigns. These functional Crusader swords and decorative Crusader swords are perfect for re-enacting your own medieval battles and displaying in your home or office as a unique accent. Several sword replicas feature a cross on the pommel and other ornamentation for an authentic period look. Crafted by excellent manufacturers like Darksword Armoury, Denix, and Legacy Arms, these Crusader blades are sure to appeal to history buffs and weapons enthusiasts. 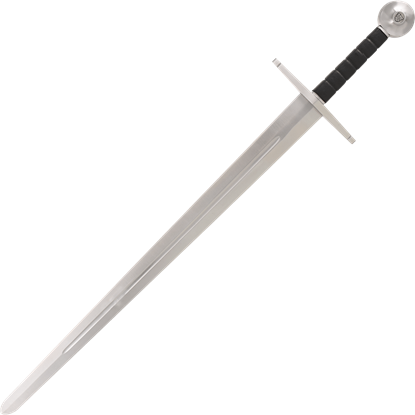 The Acre Broadsword has been hand-forged by expert smiths with decades of experience, ensuring that it will make a fantastic weapon for your home armory. The functional sword is crafted from tough 1065 high carbon steel. The Templars were established in the early 12th century following the First Crusade and were charged with protecting pilgrims on the way to the Holy Land. 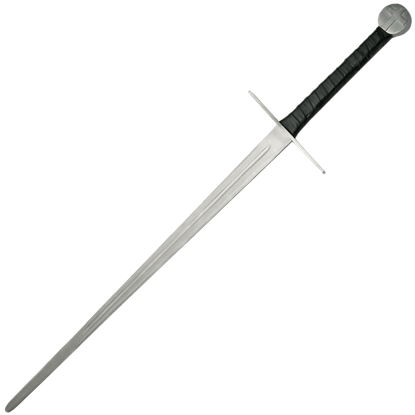 The knights of the religious military order favored a strong, beautiful sword. 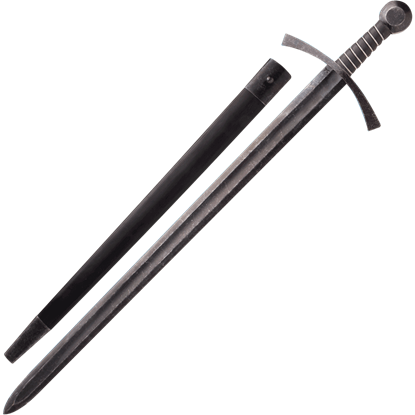 Gladius Medieval style swords, like this Black Knights of Heaven Sword, have 440C stainless steel blades that are fully tempered, but they are primarily intended for use as collectibles and decorative pieces with their eye-catching details. 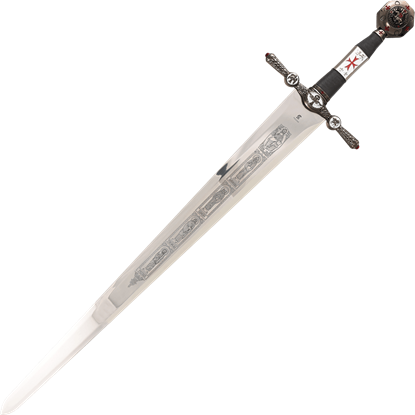 The knights of this religious military order favored a strong but beautiful sword. This reproduction features include a heavy simulated gold handle, hand guard, and fittings with a red simulated leather wrapped scabbard. Hugues de Payens was a French Knight in the Champagne region and co-founder and Grand Master of the Knights Templar. At the request of Pope Urban II, he organized nine monk-knights to defend pilgrims traveling to the Holy Land. The image of the knight and his sword will live forever through the sagas and tales of heroism during the Crusades (1096-1291) and it is easy to see why. 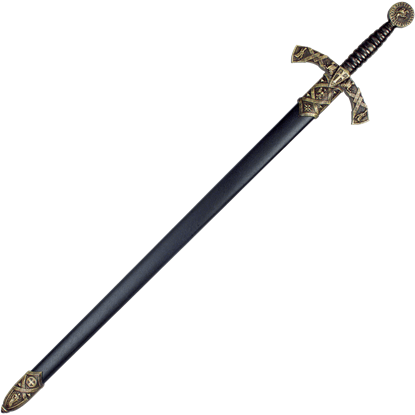 These swords were highly valued and handed down from generation to generation. 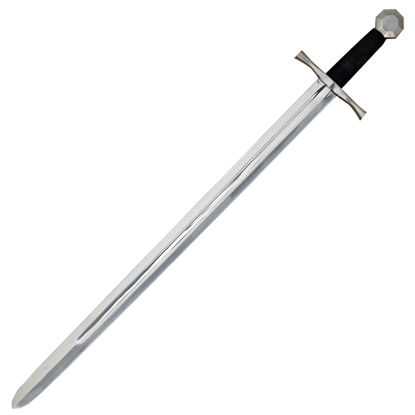 Gladius medieval swords like the Hattin Comcat Sword with Scabbard have 440C stainless steel blades that are fully tempered, but they are primarily intended for use as collectibles and decorative pieces with their eye-catching details. A typical crusader sword was usually an arming sword or a longsword, depending on the era and the crusader. This Crusader Cross Sword with Scabbard is a fantastic battle ready arming sword that features impressive crusades-era style.